No stranger to JMU men’s soccer, Tom Foley took over as head coach of the program for the 2015 campaign, after serving 13 years on the coaching staff. Just the fourth coach in the program’s history dating back to 1968, he replaces Dr. Tom Martin, who completed his 29-year stint as the leader of the Dukes with the 2014 season. In his first season at the helm, Foley led the Dukes to the CAA Tournament semifinals and finished with a 5-10-4 record overall, highlighted by a 2-0 win over No. 17 Hofstra and a tie with No. 18 UNCW. 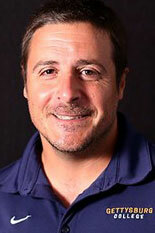 Foley served as an assistant coach from 1997-2003 before returning to Harrisonburg as the associate head coach in 2009. In his time with JMU, the Dukes have been nationally ranked in eight of his 12 years with the program. JMU found itself in the polls each year from 1997-2001, then was ranked again from 2009-2011. At the conclusion of the 2011 season, JMU finished No. 24 in the Soccer America poll while checking in at No. 20 in the NSCAA Coaches poll. 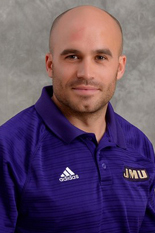 HARRISONBURG, Va. – The James Madison University men's soccer program has named Paul Zazenski as the new assistant coach, Head Coach Tom Foley announced today. His appointment is effective immediately. 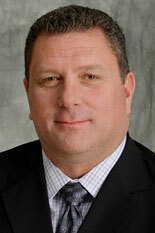 "We are excited about Paul joining our staff," Foley said. "He brings a tremendous amount of energy and experience, both as a player and a coach, joining us from a very successful program at Great Falls. We look forward to continuing to develop what we have built here as he will help us both coaching and recruiting nationally and internationally." Zazenski comes to JMU from the University of Great Falls, where he had served as the head men's soccer coach for the past five seasons and earned an impressive 70-23-4 record. He has led the team to four conference championships, two NAIA National Tournament appearances in 2010 and 2011 where his team advanced to the Sweet 16 both times. He was recognized as the conference Coach of the Year three times, including this past season, and was named NAIA Regional Coach of the Year and National Coach of the Year Finalist in 2010 after a 16-4-1 record. His teams have been ranked in the NAIA Top 25 during four seasons while also coaching at least one NAIA All-American in each of those four seasons. His teams also were successful in the classroom, sporting a cumulative team GPA of at least 3.2 for the past four years and ranking as the top NAIA school with nine Academic All-Americans in 2014. Floreal Pedrazo enters his second year with the Dukes. Pedrazo moved to Harrisonburg from the University of Montevallo in Montevello, Alabama, where he has served as an assistant coach for men's soccer since 2013, helping the team to a conference championship. He also led the Alabaster Competitive Soccer Club in Alabama as the head coach of the U15 and U18 teams and spent a year as the Montevello women's tennis head coach in 2014. During his first season in Harrisonburg, JMU won the last four games of the season for the program's first four-game win streak since 2011. The Dukes won five of their last six games and placed three players (Callum Hill, Billy Metzler and Kyle Morton) on the All-CAA Third Team. Hailing from Germany, Pedrazo gained playing experience with the U16 German National team and Offenbacher Fussball Club in the German 3rd Division from 1998-2003 before coming stateside and attending Birmingham-Southern College. There, he claimed a place on the Big South All-Freshman team and All-Big South First Team while winning back-to-back regular season championships in 2004 and 2005. Jeremy Spering enters his eighth season as the head coach of the SU men’s soccer program in 2015. Spering has guided the Raiders to nine or more victories in three of the last five seasons, including two PSAC Tournament and two NCAA Tournament appearances. 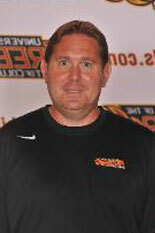 After inheriting a rebuilding program in 2008, Spering has instructed a team that has compiled a 43-37-9 record (.534 win percentage) since the start of the 2010 campaign. 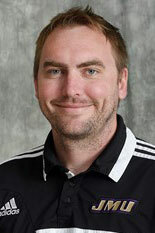 The 2010 PSAC Men’s Soccer Coach of the Year and NSCAA/Mondo Atlantic Region Coach of the Year, Spering guided the Raiders to back-to-back NCAA tournament appearances in 2010 and 2011 – the first two such berths in school history. In 2011, Shippensburg posted a 9-6-2 record and boasted a defense that allowed just 17 goals in 16 regular season games – the lowest regular season opponent goals total since the current school record of nine goals allowed was established in the 1987 season. 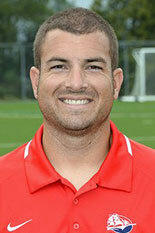 Matt Garrett is entering his ninth season as head coach of Gettysburg’s women’s soccer team in 2015. Garrett is the third head coach in the 26-year history of the program and owns a 83-49-15 (.616 winning percentage) record through his first eight campaigns, including a 53-22-5 mark in the highly competitive Centennial Conference (CC). Under Garrett, the Bullets have won at least 12 matches and have competed in the postseason in each of the last five seasons. They have also logged a record of 39-9-2 against Centennial foes over the same span. The team enjoyed an outstanding season in 2014, finishing 13-4-2 and earning an at-large berth in the NCAA Division III Tournament. Gettysburg also went 9-0-1 in the Centennial Conference to place first in the CC standings, marking the top finish for the Bullets under Garrett. With their first-place finish, the Bullets also captured the top seed in the CC playoffs and the right to host the conference tournament. Garrett was honored as the 2014 Centennial Conference Coach of the Year. Garrett’s teams have been typified by stingy defenses that have yielded less than one goal per game in six of his eight campaigns at the helm. In 2014, the Bullets tied the school record for shutouts (13) for the second year in a row. Over the last eight seasons, Gettysburg has racked up 76 clean sheets in 147 matches. Purple Dog Soccer camps are open to any and all participants; limited only by age, grade level, and/or gender.